Different Results—This Time For Sure! Cut through all the malarkey of supply-side economics and just look at what tax cuts have done for us. Or you could look at what tax cuts haven't done for us. 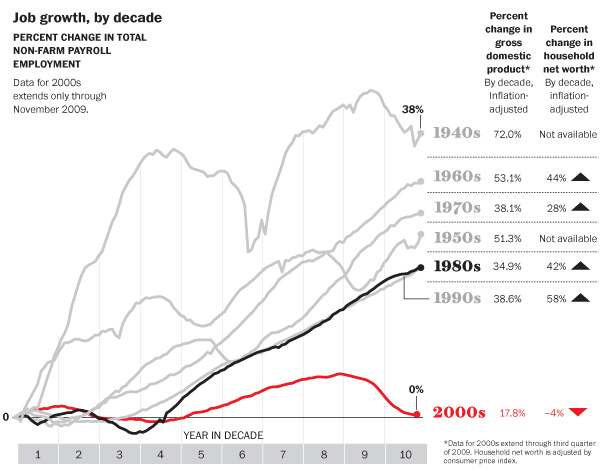 The U.S. economy has expanded at a healthy clip for most of the last 70 years, but by a wide range of measures, it stagnated in the first decade of the new millennium. Job growth was essentially zero, as modest job creation from 2003 to 2007 wasn't enough to make up for two recessions in the decade. Rises in the nation's economic output, as measured by gross domestic product, was weak. 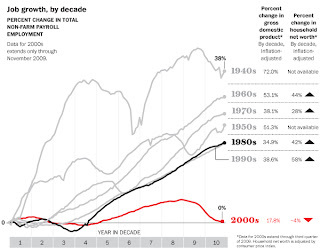 And household net worth, when adjusted for inflation, fell as stock prices stagnated, home prices declined in the second half of the decade and consumer debt skyrocketed. So why exactly should we expect a different result if we elect more of the same politicans wanting to enact more of the same policies? Something else I've been wondering, if tax cuts are always the right policy prescription for any economic diagnosis, how do you know when to stop? Even if you could cut all taxes to zero, then what? I'd like to see the wingnuts politicians who robotically advocate ever-more tax cuts tell us what the "right" tax rate is, i.e. when would taxes be cut enough, and how will we know?